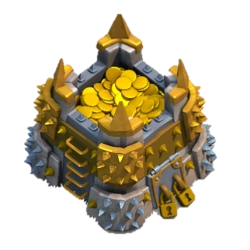 The Gold Storage holds your gold that your gold mines have produces or that you have looted in raids. With the gold in your gold storage you can purchase and upgrade buildings in your village. When you upgrade a gold storage it still works. Attackers can steal 20% of the total gold stored in your gold storage. That is a maximum of 198k gold from the storages. Most people protect the gold storage very well because gold is a precious metal in the game. It costs elixir to upgrade the gold storage. A level 11 gold storage can store 2.000.000 million gold. At townhall level 9 you can have 4 gold storages.